The series of precision planetary gear box Has been realized to service the most demanding Of applications. precision, low noise, reliability' high efficiency and it's physical dimensions. There are six sizes of gear reduction ratios From 3 to 1300 and back lashes up to 3'. The ac brushless servomotors are able to combine versatility and elevated performance thanks to the magnetic circuit which was developed using the most up to date software. The NdFeB permanent magnets are used to their maximum potential, marrying elevated power rating, maximum in line torque and low inertia. 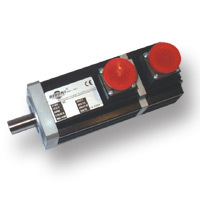 There are five motors in the range with three phase power supplies from 48V to 400V and torque from 0.2 to 20Nm. 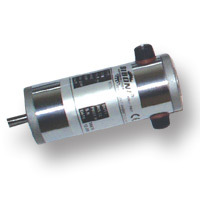 These motors have been created for those conditions in which a high power rating is required but size is an issue. Market leading technology has been used in their development and the materials used are of the utmost quality. The resultant series offers torque from 0.1 to 3.5Nm and a power rating up to max of 1Kw and these motors are ideally suited for use in highly dynamic automation processes. 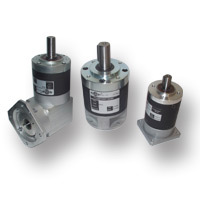 The series of DC motors has been developed for servo-motion applications. Ceramic permanent magnet technology allows us to product a range with an exceptional quality/price ratio, a low moment of inertia and extremely efficient motion control. The series is available in many different sizes whit torques ranging from 0.03 to 2.5Nm and voltages from 12V to 170V d.c., with the possibility of adding our tachometric dynamo, an encoder or brake to the same shaft. The series was developed for maximize efficiency in low voltage applications and situations where the motors are used intermittently, e.g. electric vehicles. The high inertia and optimized electromagnetic commutation provide a good balance between the dynamic performance and high starting torque which served to improve the battery life. 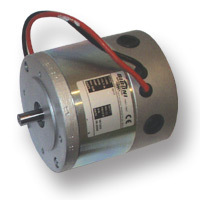 There are six sizes of motor in this series and they can be supplied with ventilation if required, in 12V, 24V, or 48V and with a power rating ranging from 150W to 1.5 KW.